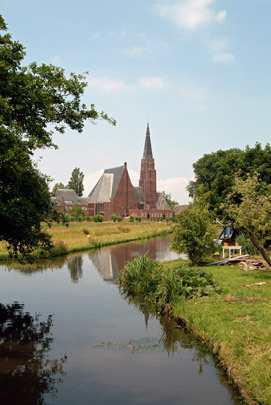 One of the most important pre-war church designers is the Groningen architect Egbert Reitsma. There was an almost unlimited budget available for the unprecedented wealth of Expressionist form characterizing this 'cathedral' at Andijk. Its main space seating 1200 is roofed by a complex parabolic vault. The plan is set breadthwise with the pulpit on the long side opposite the main entrance with its large window. The fenestration lower down comprises stained glass depictions of trade, technique, agriculture and shipping.